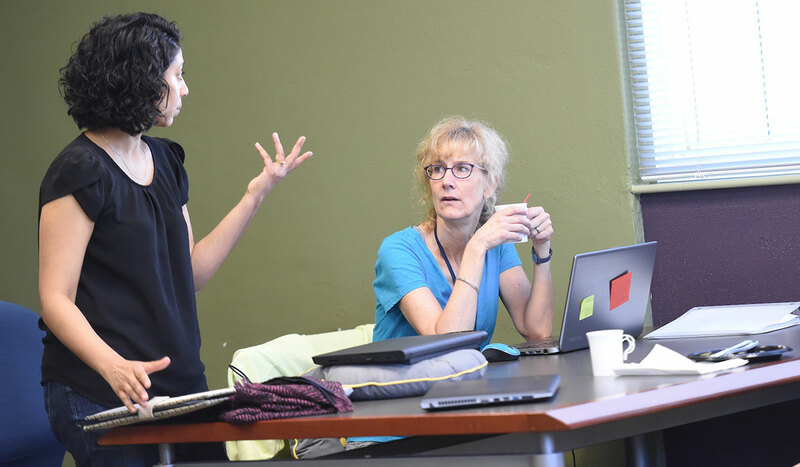 Thirteen faculty members had an opportunity to polish their grant writing skills during a weeklong writing retreat sponsored by the University Writing Center and the Office of Sponsored Programs. The retreat, which took place the week of May 15, included guest speakers, webinars, and scheduled time daily for focused writing. It was designed to help junior faculty members from across the University improve their technical and persuasive skills in writing grants. Winning grants to fund research is an important way that junior faculty members can grow and advance in their careers. Ralph Albano, associate provost for research, said the retreat was a valuable opportunity for faculty members to learn about effective grant-writing methods in a focused and fun environment. Retreat participant Sharon Ann O’Brien serves as the director for Catholics for Family Peace in the National Catholic School of Social Service (NCSSS). She said she learned a lot about grant writing during the week, including the importance of persistence and not taking rejection personally. Biomedical engineering professor Chris Raub also participated in the retreat. He said he enjoyed working alongside junior faculty members from other departments and schools across the University, including NCSSS, psychology, biology, and others.